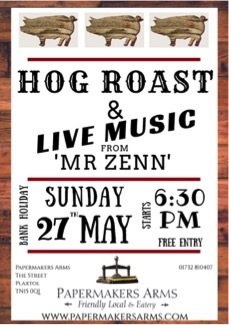 Bank Holiday Hog Roast & Live Music!! The next bank holiday will soon be here and we have another great Sunday evening planned! There’ll be a Hog Roast on the menu, prepared by our very lovely butcher HW Coldbreath. Plus we are delighted to welcome back the fabulous Mr Zenn band for another fantastic evening of Live Music! It all starts at 6:30pm. We’d love to see you there!